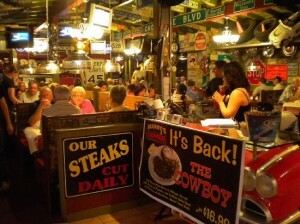 Manny's Chophouse - The Best Steaks Around! When the sun goes down in The Sunshine State the fun just keeps on coming! 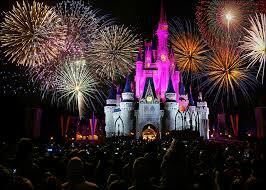 With a range of activities for all ages, you will never be short of things to do on your Orlando Florida family holiday. After a day at one of the Disney theme parks, shopping at the mall or just chilling by the pool, there's nothing better than a delicious dinner to end the day. There are so many fantastic places to eat out in Orlando that we defy anyone who can return from vacation without at least putting on a few pounds! Manny's Chophouse and Carrabba's are some of the best restaurants that we have ever experienced world-wide. 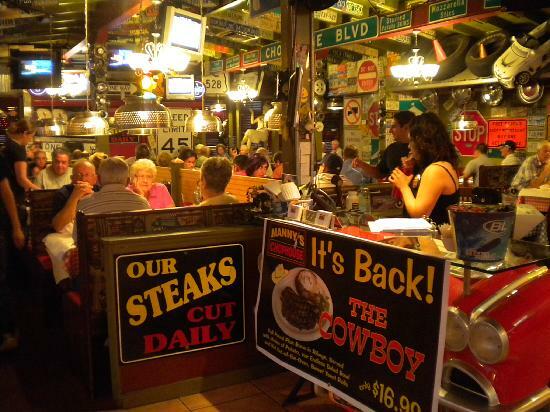 The incredible chef's at Manny's will be sure to cook you a steak dinner that is out of this world, and at great prices too! Over at Carrabba's you can sample an endless array of wonderful Italian favourites which can be nicely washed down with some of their famous Carrabbarita cocktails - just don't have too many! 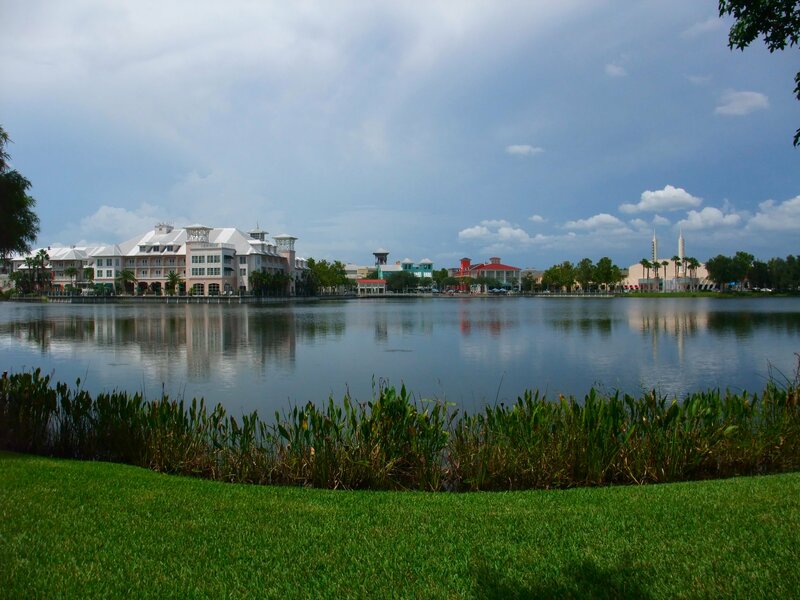 One of our favourite evening activities in Orlando is a relaxing night-time stroll through the charming, Disney-built town of Celebration, Sitting on one of the cosy rocking-chairs overlooking the lake, enjoying an ice-cream and watching the sun go down is pure perfection. This town is unlike any you will have ever encountered before and many of the houses have a Desperate Housewives look to them, complete with manicured lawns and fairytale-esque turrets! Peruse the quaint and quirky streets on one evening of your vacation and see for yourself! Universal's City Walk is perfect for those nights when you are feeling lively. It has some fantastic eateries, as well as boasting an array of incredible shows. City Walk is dubbed The Entertainment Capital of Orlando and it's plain to see why! City Walk has a definite party vibe to it, although there are some family friendly places to go earlier on in the evening. However, we recommend checking before you go, as many places have an over 21's policy. If you are looking for somewhere to eat and drink, Bob Marley: A Tribute to Freedom, Bubba Gump Shrimp and Hard Rock Cafe are some of our favourites. 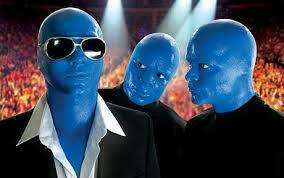 If it's entertainment you're after then The Blue Man Group Show is a must see! There's also a 20 screen IMAX cinema and several live music venues. Last but definitely by no means least: fireworks! Magic Kingdom and Epcot both end each day with a spectacular fireworks display that really has to been seen to be believed. Both parks pull out all the stops to make sure your day ends with a bang. There is nothing more magical than holding your family close, staring up at the sky and watching the wonder unfold in front of you. This is what holidays are all about!